The Hiatus is licensed and insured for up to 6 passengers. 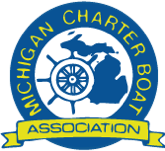 All charters are 6 hours dock to dock. The morning charter departs at 5:00 a.m. and the afternoon charter departs at 3:30 p.m. Customizable charters and multiple boats are available upon request. Your captain and crew put a great deal of time and effort preparing for your charter and are dedicated to making sure you have a successful and enjoyable time on the water. Showing your gratitude with a customary tip to the crew of 15%-20% is respected and greatly appreciated. A $100 deposit is required to secure your charter. We accept cash, checks and most major credit cards. Cancellations or changes to reservations can be accommodated within two weeks of your scheduled date. Call or text message Capt. Micah at 517-230-8111 or email: micah@hiatuscharters.com. The PayPal receipt will list our business name as Chrome Pursuit Charters LLC.